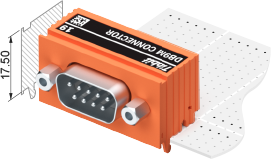 With double the width of C1s, C2 Tibbits are wide enough to house DB9 connectors and 9-row terminal block banks. They occupy two "C" sockets on the standard tile. 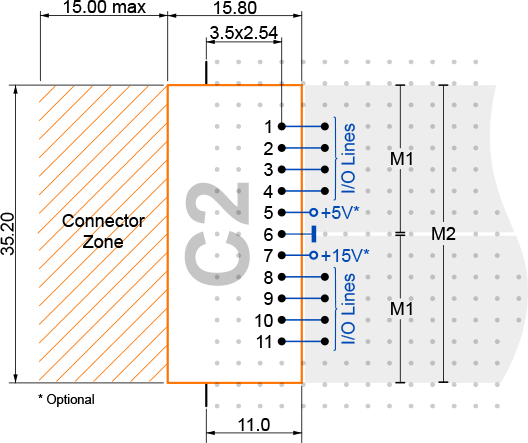 C2s have the equal width and height with M2T devices. Tibbit "connectors" have hooks that hold on to the host board's edge thus adding mechanical stability. C2 Tibbits are always orange. C2s never have status LEDs. Pins 1-4 and 8-11 are I/O lines that connect directly to the I/O lines of two adjacent "M" sockets. A single C2 may connect to one M2 Tibbit or two M1 Tibbits. Pin 5 is the +5V power pin. Most C2 devices only house connectors and do not require any power. Still, we are sure there will be uses for this power pin in the future. Pin 6 is the ground pin. Pin 7 is the +15V power pin. Again, this is reserved for the future use. Since C2 devices have dedicated ground and power lines they are not dependent on "M" Tibbits for power and ground, as C1s are. There is no provision for connecting -15V power though. If any C2 device needs -15V then this must be supplied by the adjacent "M" device.